Planning a bachelor party? Have the pre-wedding jitters? Then it?s time for some paintball! Action Packed Paintball Games is what you need for all your bachelor party entertainment. A few paintball games will get out any nervousness you?re feeling, while at the same time, you?ll have a complete blast. Action Packed Paintball Games is the place you’re looking for. We are an exciting outdoor paintball park that offers CO2 and compressed air fill paintball guns. If you are looking for a theme for a bachelor party, we have several different scenarios and games your party can choose from. All of our private paintball games are available anytime. If you are looking for something fast paced, or maybe something like a stealth and concealment game, we have got you covered. From our City of Tombstone to the Woodsball Fields, you can create many different scenarios and games for an amazing, unforgettable time. Bonding will ensue, and whoever comes out on top gets ultimate bragging rights as paintball champions. We have many rental packages to choose from as well as private, reservation games, or walk-ons, if that?s your thing. We have a friendly attentive staff that will go out of their way to take care of all of your paintball needs. Plus, we offer amazing layouts to really get you into the game. To request a reservation please call 952-492-6776 and we will be more than happy to set everything up for you. 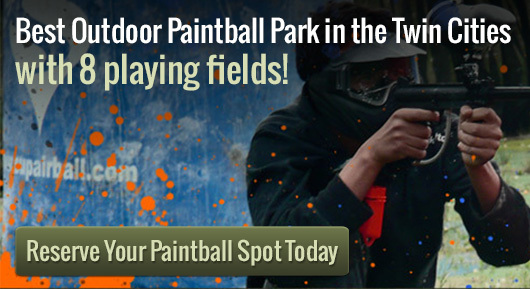 Action Packed Paintball Games, the best bachelor party fun you can have! We can accommodate any size group at Action Packed Paintball. We are capable of running exclusive paintball games 7 days a week, from sun-up until sun-down. Remember to call us at 952-492-6776 in case you have any questions or if you would like to book a time.